RAE stencils are precision cut in tough flexible Low Density Poly Etheylene (LDPE) Plastic.We carry a large selection of stencils in a wide range of sizes. From our 2 inch wording stencil, to our 144 inch airport character stencils. Browse all of our different catagories of stencils to find what suits your needs. We offer stencils in both Duro-last. 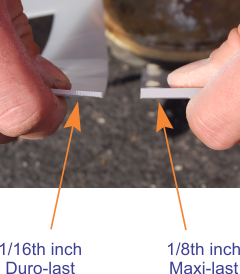 1/16th inch, thickness, and Maxi-last, 1/8th inch, thickness. The Duro-last thickness is more flexible while the Maxi-last is heavier and tends to lay flatter without wrinkles. Try the Duro-last stencils for occasional use, and try the Maxi-last for frequent use. RAE stencils are easily cleaned by simply flexing the stencil to break the barrier between paint and plastic. Once you flex them the paint peals off right away.